Maybe he or she have seen some of the “pros” at work on their television but had never seen a magician at work up close and personal. It’s. . .well it’s magic! Try your hand at box tricks. Paper and rope tricks are always well accepted. What kind of costumes and makeup you need. Selecting microphones and other equipment. How to handle the media and advertising. 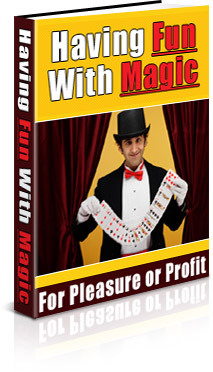 This 47 page PDF ebook comes with Private Label Rights.